Snoring is caused by vibration in your airway while you sleep. When you sleep, your muscles relax and your airway narrows, leading to snoring. SleepTight Mouthpiece holds your jaw and tongue forward, opening your airway. This improves breathing and reduces snoring. 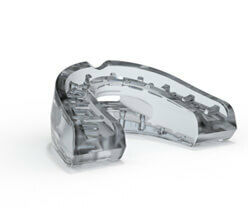 By wearing SleepTight Mouthpiece while you sleep, your airway remains open. "At first my snoring was just a nuisance to my wife, Patti. But it became more and more of an issue and I tried a lot of things like ear plugs for her, white sound, and leaving the bedroom. But, the problem was me, not her. So, I researched for other ways to get rid of the noise and I wanted a permanent fix. So, I tried both sinus and palatal surgeries. Unfortunately, after both of those surgeries, the result was still no better. Then I began additional research and began taking courses in sleep dentistry and discovered that a simple mouthpiece, which moved the jaw forward, could solve the problem. I was also interested in the problem of altitude sickness, which is caused from a lack of oxygen while sleeping at high altitudes (typically above 8000 feet). I theorized that a mouthpiece which opened and advanced the jaw could improve that altitude sickness, which proved to be correct. Since snoring is caused by the vibration of tissues as the body attempts to get more oxygen, I now had a solution which could help both conditions. Eureka! Now I can help myself and everyone else who snores. My goal then was to offer an easy to use and cost-effective solution that the average person could use to help their snoring. I found a manufacturer, who helped me design the SleepTight Mouthpiece and now we are offering that solution around the world. Yes, Patti is sleeping better now!" SleepTight Mouthpiece (STM) management and employees accept responsibility for the complete satisfaction of our customers and are dedicated to being compliant with all regulatory requirements. Our FDA clearance assures our customers' safety and efficacy for the product’s intended use. We continually seek ways tp improve our customer service, applications of the STM and ways to improve the STM itself. We exercise this responsibility through the comprehensive training of our employees, the adherence to proven procedures and quality assurance practices, the continual improvement of the quality management system, and the total commitment to meet and exceed requirements. 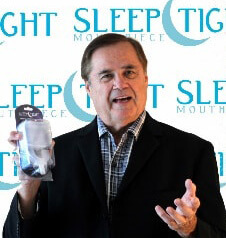 We promote the SleepTight Mouthpiece for the treatment of snoring and mild to moderate obstructive sleep apnea and continue to look for other treatment option applications. We welcome customer comments and feedback. It is our intention to provide accuracy and truthfulness in our statements regarding our sleep solution products as based on input from experts in our field.